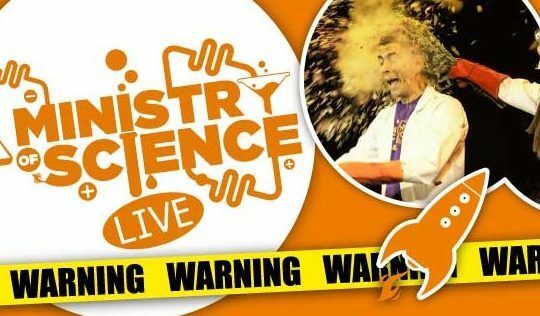 Ministry of Science Live is not your ordinary science show; it comes with a BANG. It comes with a whoosh. But most of all it comes with a hovercraft built on stage! This new production takes an anarchic approach to science communication whilst looking at the inventors and engineers who have shaped and inspired the modern world that we live in. From liquid nitrogen frozen flowers to hydrogen bottle rockets. From Buzz Aldrin to Virgin Galactic. From a cat food tin to the hovercraft. From the discovery of methane to the invention of the battery. Join the super talented presenters and the voice over from X Factor’s Peter Dickson as they take you on a journey using brilliantly designed demonstrations with a few loud bangs to lead the way.